Glyphis is a genus in the family Carcharhinidae, commonly known as the river sharks. This genus contains only three species. Further species could easily remain undiscovered, due to the secretive habits of Glyphis sharks. Their precise geographic range is uncertain, but the known species are documented in parts of South and Southeast Asia, New Guinea, and Australia. 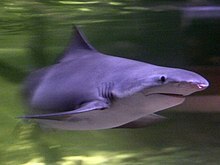 Of the three currently described species, the Ganges shark is restricted to fresh water, while the northern river shark and the speartooth shark are found in coastal marine waters, as well. The bull shark (Carcharhinus leucas) is sometimes called both the river shark and the Ganges shark; it should not be confused with the river sharks of the genus Glyphis. ^ Li, Chenhong; Corrigan, Shannon; Yang, Lei; Straube, Nicolas; Harris, Mark; Hofreiter, Michael; White, William T; Naylor, Gavin J. P (2015). "DNA capture reveals transoceanic gene flow in endangered river sharks". Proceedings of the National Academy of Sciences. 112 (43): 13302–7. doi:10.1073/pnas.1508735112. PMC 4629339. PMID 26460025. This shark-related article is a stub. You can help Wikipedia by expanding it. This page was last edited on 26 February 2019, at 23:27 (UTC).